Okay, I promised you an unhealthy salmon recipe, so here it is! The most awesome thing about this recipe is that it’s so versatile. 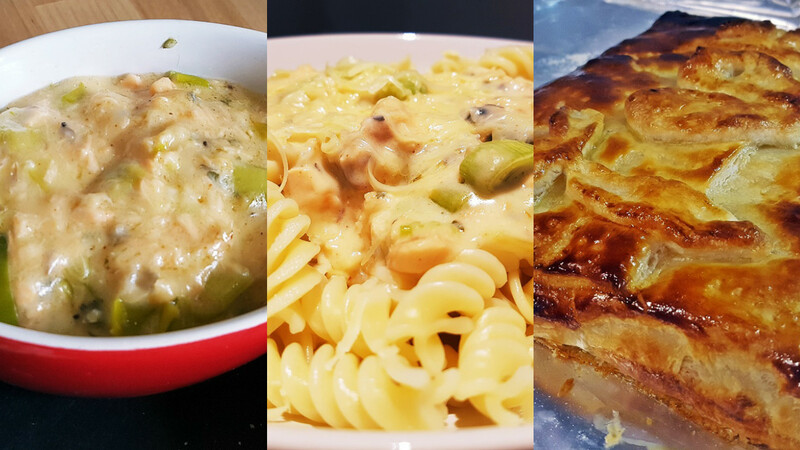 You can use this salmon cheese sauce in a ton of different dishes, so make a big batch, freeze some, and have some for a couple of totally different meals this week. The trickiest part of this recipe is the cheese sauce. I’ve been making it for years and yet I still manage to mess it up half the time – generally either by adding my milk too quickly or by adding too much of it. So remember YOU CAN ALWAYS ADD MORE MILK BUT YOU CAN’T TAKE IT OUT! Heat the oil in a frying pan. Fry the salmon (skin side down first). Break up the salmon into large lumps as it cooks. Cook whichever vegetables you’ve decided on. Meanwhile, melt the butter in a saucepan. Take off the heat and add the flour. Stir until you have a paste (this is called a roux). Add the milk slowly (too quickly and it will be lumpy). Return to the heat and stir constantly (if you don’t it will be lumpy!) while it thickens. Add the cheese to the sauce, as well as parsley, paprika, salt and pepper. By this time, the salmon and veg should be cooked. Add them to the sauce and stir. This cheesy salmony sauce can be combined with tons of other stuff to make a range of amazingly tasty meals. Add some cooked fusilli, penne or macaroni at the end and stir to coat. Serve topped with fresh parsley, parmesan and a scattering of paprika. Take some ready made puff pastry, roll out and dollop your sauce in the middle. Fold over the edges, brush with beaten egg, and bake in the over at 200deg for ~30 minutes (or until golden on top). Serve with salad. Serve hot in a serving bowl with slices of baguette and other deli items or with crudites. Which dish looks the most delicious? How else would you serve this salmon?